Offers a quality of pure (without UV) and natural (CRI 85) light. Its anti-flicker and glare system, protects your eyes and thus significantly reduces feelings of fatigue, while ensuring optimum illumination field. With a lifespan of 30000h, an outstanding energy efficiency of 12W/600lm, saves 80% energy compared to an incandescent lighting for the same brightness. One touch to turn on and off with the Sense touch control. Too much light or not enough? No more pre-programmed levels! A long press then Stepless DIMM technology is activated to offer up to 80 different luminances, rich and accurate as you wish. Uses extruded anodized Duralium, an aluminum superalloy used in advanced technology and aeronautics, where lightness and robustness are key. Chrome steel joints and controls highlight its elegant lines. 360° Rotatable, variable inclination, orientatable, foldable, flexible in any direction, can be positioned exactly the way you want and offers you unlimited possibilities of configuration. Its modular structure allows you to assemble/dissemble its components in few seconds. Pls Note: Due to the limitations of some policies, batteries are not included in the package. It needs additional 2 AAA batteries for remote control. 2 optional operation modes to power on/off and adjust the light intensity gradually without levels: endless possible settings, the last brightness setting will be stored in memory for your next use. 5 modes can be selected directly from remote control for a variety of tasks. 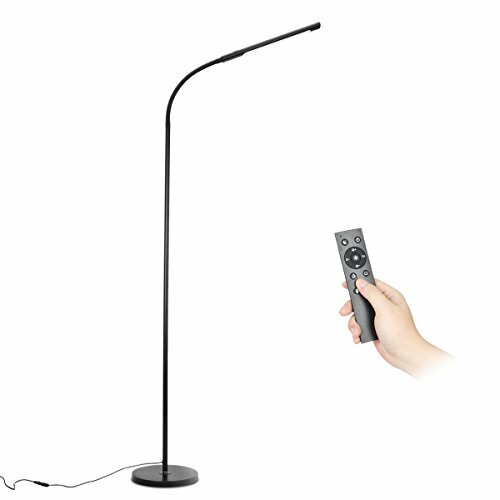 Energy saving LED floor lamp, only 12W but output higher brightness in lighting, 5 times less of consumption than normal lamps, low consumption, environmentally friendly, very long lifetime of 30000 hours.